Posted in: 1 Pageant Pages, 2 Shout-out-Looks. Tagged: Agatha Lei Romero, Ana Patricia Asturias, Bb. Pilipinas 2018, Janice Roman, Kathrine Ventura, Kayesha Chua, Muriel Adrienne Isidore Orais, Rose Marie Murphy, Shane Tormes, Sigrid Grace Flores, Vickie Marie Rushton. 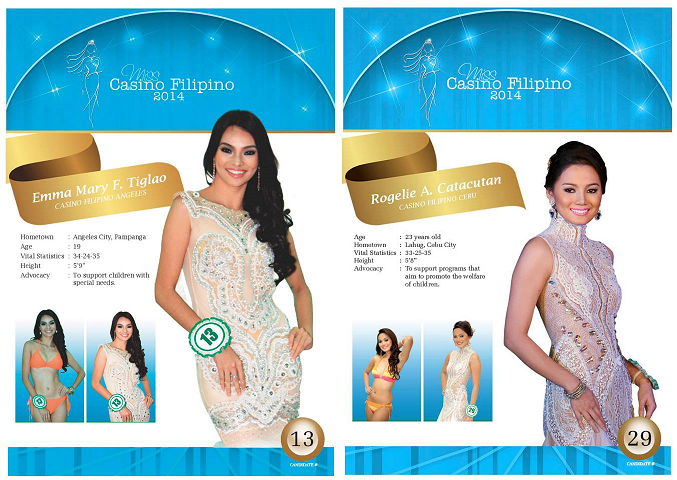 Miss Casino Filipino 2014: Who will win tonight? Posted in: 1 Pageant Pages, 2 Shout-out-Looks. 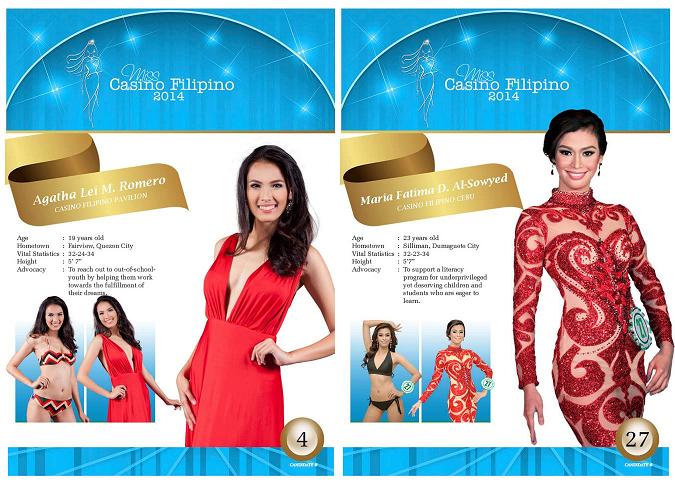 Tagged: Agatha Lei Romero, Emma Tiglao, Ivy Enriquez, Maria Fatima Al-Sowyed, Miss Casino Filipino 2014, Rogelie Catacutan, Rosemary Turner. 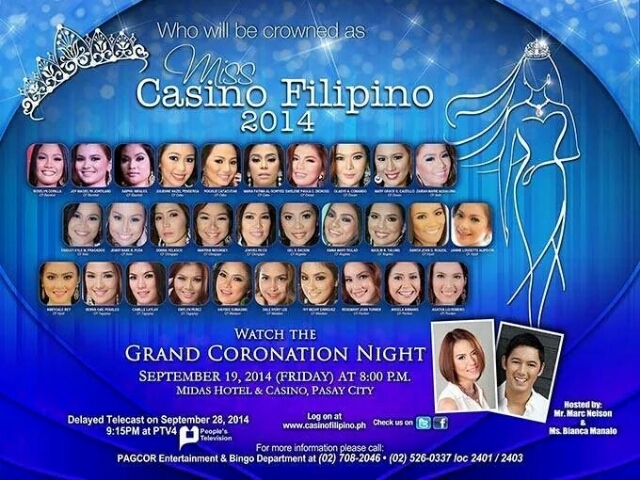 While a big chunk of my friends will be heading over to SM MOA Arena to ogle at denim- and underwear-clad celebrities and models walking the ramp in Bench for “The Naked Truth” tonight, a good number will prefer instead to avoid the big crowds and troop to Midas Hotel and Casino to watch Miss Casino Filipino 2014. 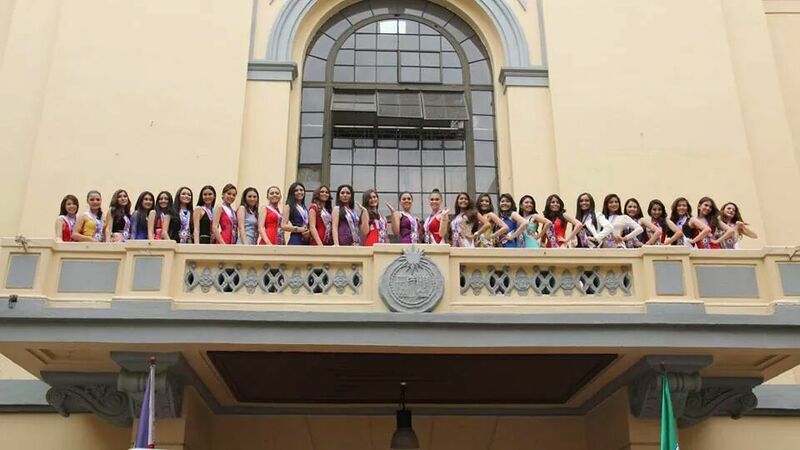 Thirty young and beautiful Filipinas representing different CF centers all over the country are vying for the crown that comes with a half a million pesos in cash prize. Among them, I am specifically giving my good luck wishes to the six (6) contestants below. 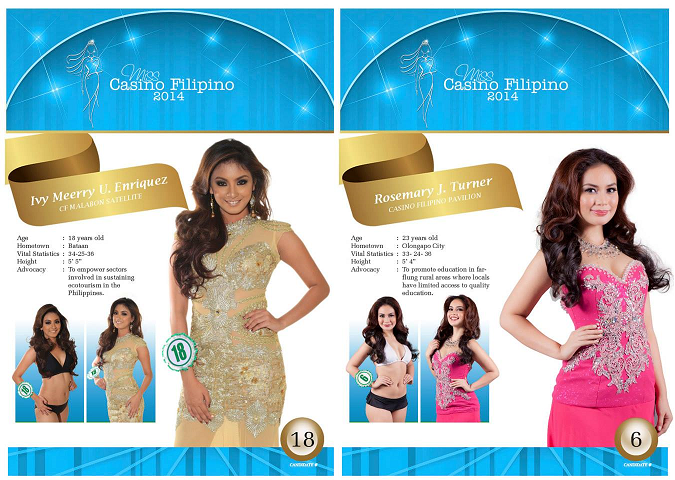 I would be happy to see one of them win, especially former Binibini Emma Mary Tiglao. 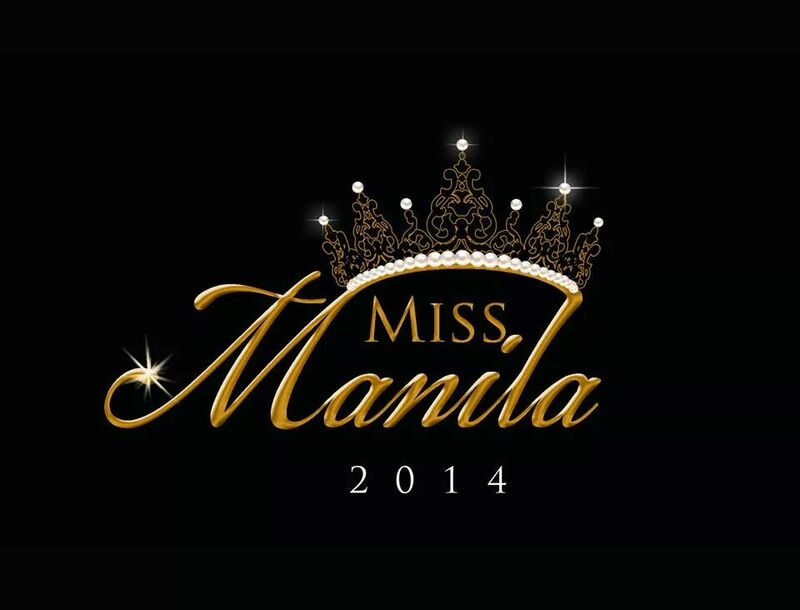 Who will win Miss Manila 2014? Posted in: 1 Pageant Pages, 2 Shout-out-Looks. Tagged: Agatha Lei Romero, Alexandra Adbon, Allhia Charmaine Estores, Alyssa Jasareno, Ana Catherine Louise Langitan, Angelia Gabrena Ong, Arielle Tumanut, Bernadette Paez, Cheska Laurente, Jennifer Ann Mangaring, Judy Chua, Julian Aurine Flores, Justine Felizarta, Katrina Grace Reyes, Kayesha Clauden Chua, Krischelle Halili, Leona Paula Santicruz, Lori Anne Mhei Lontoc, Mary Monique Angelika Trinidad, Mharyel Tapia, Michelle Abcedre, Miss Manila 2014, Nikki Udani, Nina Ricci Manangan, Princess Angela Abella, Queenie Bautista, Ruth Sabrina Linganay, Samantha Page Haire, Shiela Mae Morales, Shymain Macaso, Susanne Samantha Stefanowitz. 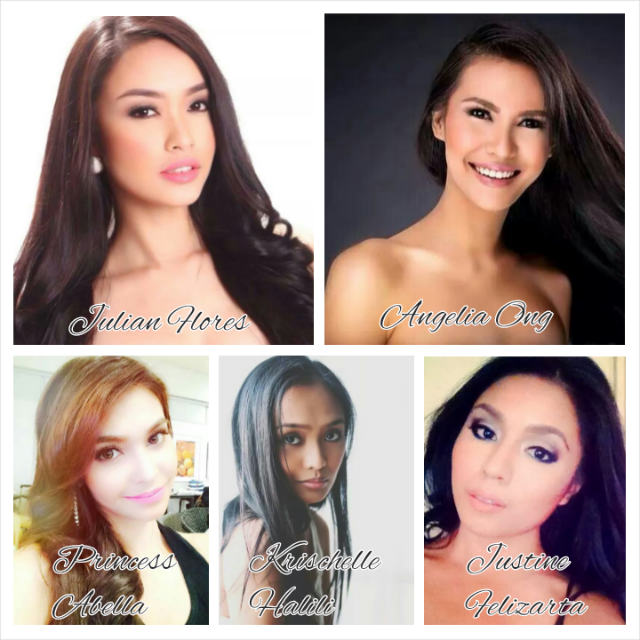 Only one of them will take home the crown and become the city’s brand ambassadress for 2014. Here is my photo rundown of twelve (12) short-listed ladies for the title. 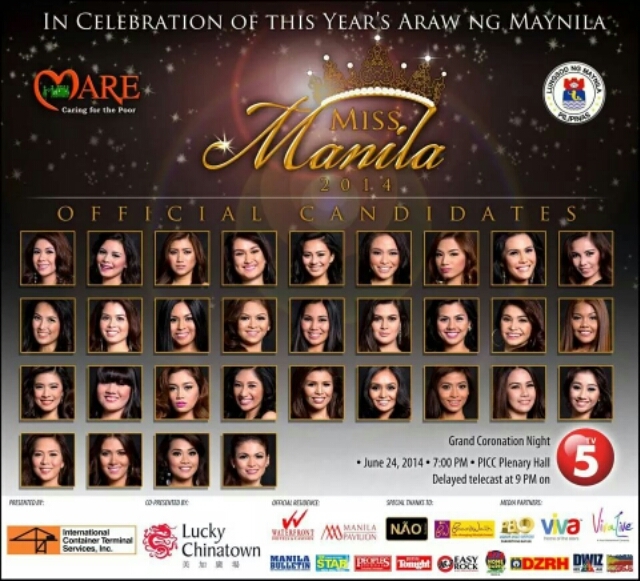 One of them could be the winner on Araw ng Maynila itself, the scheduled finals tonight at the PICC Plenary Hall.